Jan came to work for the agency over 10 years ago, developing the individual health department. She truly enjoys working with her clients and takes great pride in servicing them well. 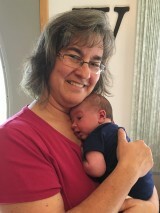 You can find her on Sunday mornings walking the nursery hall at Blythefield Hills Baptist Church, keeping the littlest of church-goers content, which also provides Jan with a lot of contentment. Jan enjoys reading, traveling and experiencing new restaurants with John.